This message was preached by Colin D Cruz at Word of Grace Church on the 1st of Feb 2015. To listen/download the audio please click here. Paul is in prison in Rome chained to a guard but is free to proclaim the gospel. He was not concerned about his chains because the gospel was being preached. We saw that the Philippian church was quality churches that were into in any doctrinal error or immorality. Paul was very fond of them. However he appealed to them for one thing: UNITY. We touched upon it last week but we’ll look at it in more detail this week. Phil1:27 we see this themed working through the book. We hear of people being persecuted in India. What is our response? To forgive! Verse 28. Conduct yourself in a manner worthy of the gospel and do not be afraid to stand as one man. When you are united it s a sign to the persecutors that they will be destroyed. Like minded. 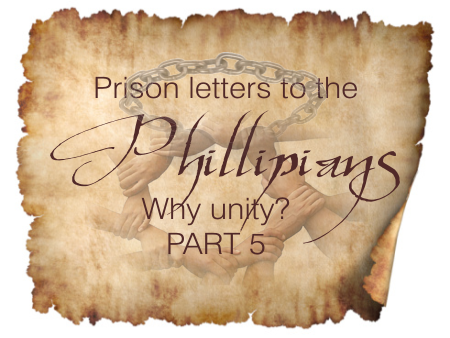 We saw the 4 things that we have received as a resulted of being united to Christ. One in unity and in purpose is not uniformity. God celebrates diversity. Just look at nature. Like mindedness is based on the WORD. The love that Jesus has for us is something we can all display. Jesus loves us unconditionally. WE are called to love our enemies and our brothers and sisters. How does this unity work out? In order to achieve unity we have to pursue humility. To be united we have to be humble. What does that mean? Do nothing out of selfish ambition or vain conceit. This is contrary to the world’s thinking. The world says look after number one, the WORD says how we can look after others. Thinking of others as better than ourselves is difficult. It shows up in our conversations. Do we show concern for others or only talk about ourselves? Can we appreciate people? Can we serve others? Who can we take out for a meal? So it begins with the attitude of the mind and then action. Others are worthy of better appreciation. There is an enemy out there that we need to be united against. So let’s stand together and not fight each other! All our life we are taught to look after ourselves. So this does not come naturally to us. All this finally is for the advancing of the gospel. We can have a friend till the grave or beyond the grave. We want friends beyond the grave and this will happen as we advance the gospel. Let’s be involved in fruitful labour. Let’s work together. If we pursue humility, if we change out thinking and look out for others interest unity will happen. Amen!